Rizzoli Universe Promotional Books, 9780789324177, 216pp. From the author of French Country Hideaways comes an enticing new insider’s entree to Paris. Eschewing the larger hotels and chains, Casey O’Brien Blondes has put together an impeccable list of four-star escapes carefully selected for their interior design, authenticity, panache, and personalized service. Grouped by theme—including literary, historic, and boudoir—the hotels present an enticing range of décor, from the timeless splendor of the Raphael, with its incomparable view of the Arch de Triomphe from its lush rooftop garden restaurant, to the minimalist verve of Hotel le A, off the Faubourg Saint-Honoré, where graphic black-and-white décor harmonize with Gallic élan. Each is unique, yet all share in common family or manager ownership, fewer than 100 rooms, generous room size, and very distinctive French style. 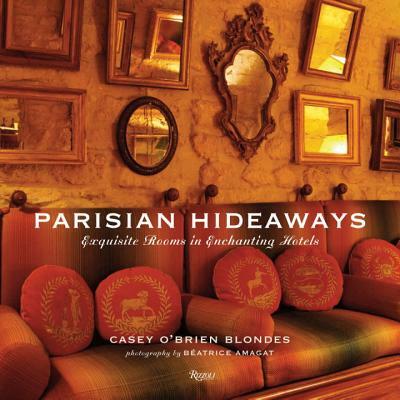 With lush color photography and in-depth descriptions of each hotel, including a list of neighborhood restaurants, boutiques, gourmet treats, curiosities, or walking tours, Parisian Hideaways is a must for anyone longing to escape to or be inspired by the City of Lights. The author of French Country Hideaways, Casey O’Brien Blondes and her artist husband moved to Paris from the U.S. in 1988. She lives with her family in the Loire Valley. French photographer Béatrice Amagat spent seventeen years styling the pages of French ELLE and French Cosmopolitan. Her work has been featured in Architectural Digest France and World of Interiors.